33 Minutes: Protecting America in the New Missile Age is a one-hour documentary produced by The Heritage Foundation that tells the story of the very real threat foreign enemies pose to every one us. The truth is brutal - no matter where on Earth a missile is launched from it would take 33 Minutes or less to hit the U.S. target it was programmed to destroy. 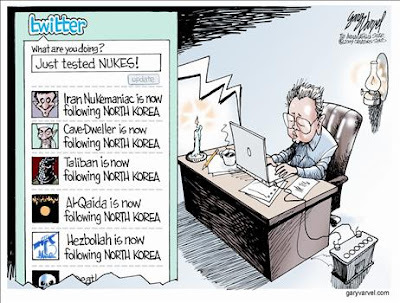 ploy for its own defense and the peace-loving world's security. This chart from dshort.com compares the S&P 500 and NASDAQ (from the top of the Tech Bubble burst in March 2000 to present day) to the Dow of the Great Depression and the Nikkei 225 of the 1980s Savings and Loan Crisis - all adjusted for inflation, of course. There are two very simple points you need to take from this chart. The first is that anyone who claims President George W. Bush didn't inherit a recession in 2001 is just empirically incorrect. The second point is that, if these market trends aren't just a miraculous coincidence... this recession isn't even close to being over yet. In fact, if the markets continue to trend parallel to the Great Depression's Dow and the Saving and Loan Crisis' Nikkei 225, 2009 may be the best economic year Obama sees for the rest of his stay in the White House. 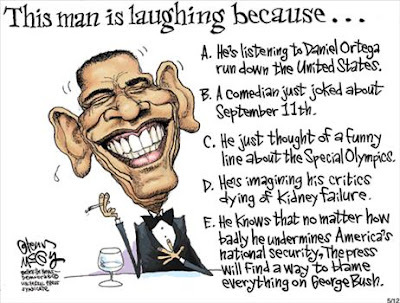 However, Barry is a shrewd politician. 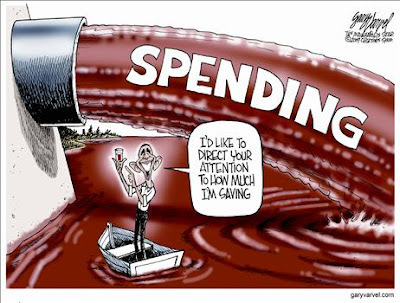 That's why he back-loaded his "stimulus" spending such that only 3% of it has been spent, despite the panicked frenzy with which congressional democrats forced the passage of the "stimulus" bill without having read it. The vast majority of Obama's generational theft expenditures will be divvied out at about the time he will begin his bid for reelection. I would expect nothing less ego-centric from a politician who, as a legislator, wrote more memoirs than national laws. If you combine the frightening market trends illustrated by dshort.com with the unprecedented damage the US dollar has taken, the prognosis doesn't look good. But hey... this was "the change we needed," right? Can we destroy the economy of the most wealthy country in the world? "Back in the thirties we were told we must collectivize the nation because the people were so poor. Now we are told we must collectivize the nation because the people are so rich." This isn't a game. I don't know when politics stopped being serious and started substituting for late-night entertainment, but play time is over. If something or someone doesn't force the federal government to change course, the damage this economy has suffered to-date is going to look like a bicycle accident compared to the train wreck bearing down on us. It seems futile to look at the policies enacted by President Reagan without first truly understanding the philosophy motivating him. To understand the philosophy of conservatism, real conservatism, one must first examine the brilliant minds which were primarily responsible for shaping and propagating that philosophy. A fundamentally valid and sound philosophy never ages, never expires. When such a philosophy makes itself visible, society ought not cast it aside because it was improperly applied. It is the improper application which should be discarded, but a valid and sound philosophy remains valid and sound irrespective of those who seek to misdefine or abuse it. The recent rallying cries for the Republican Party to "get back to its conservative roots," are not, as liberals contend, pleas for further polarization. The roots of real conservatism are populist in their appeal and inclusive in nature. All the negative stigmas liberalism seeks to pin on conservatism were not applicable to William F. Buckley's conservatism, just as the principles of Keynesian economics never could hold a candle to the free market arguments of Milton Friedman. 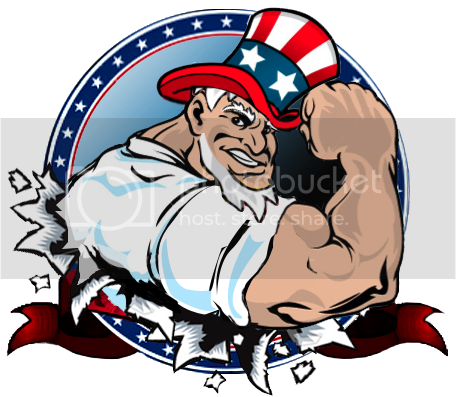 Conservatism did not fail America, wolves in conservative clothing did. For those who have never had the fortune of hearing or learning about Mr. Friedman or Mr. Buckley (i.e. those who attended public schools and liberal arts colleges), allow me to wet your lips at the cup of intellectual conservatism. Conservatism and intellectualism are not distinct, as the Left contends. On the contrary, conservatism and intellectualism are inherently and invariably linked. The loss of such lions as Buckley and Friedman is heavy indeed, but their passing does not invalidate the sound philosophies they left behind. What the Republican Party needs is not a redefinition of conservatism, but rather a return to what conservatism was always intended to be: the intellectually valid and sound conservatism of Buckley and Friedman. Let's be clear, Obama's appearance at Notre Dame was a brilliant publicity stunt. For Obama and his liberal cohorts, his appearance at Notre Dame was a win-win: they got to portray pro-life advocates as irrational, religious zealots and Obama got to pretend like he was the logical, boundary-spanner uniting the country. The commencement ceremony was likely no different than any of the classes which lead to it. As I pointed out in my tweets during the speech, the graduation ceremony served as a perfect example of just how in-bed with liberalism academia really is. I've heard many of his supporters liken his performance at Notre Dame to the "transcendental tone" used in his now famous speech on race relations. There's no denying that the man is masterful at using strawman arguments to discredit his opposition. He never once adequately addressed any of the major legal or logical oppositions to abortion, but, instead, took a "can't we all get along" approach which totally side-stepped the crux of the issue. For the MSM who claim Obama was received at Notre Dame "with open arms," it should not go unnoticed that he had a friendly audience (as always) because the vast majority of those who opposed him were either outside at a prayer vigil or previously arrested for peacefully protesting. 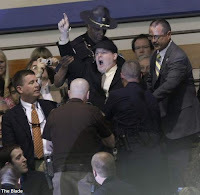 Why do I say this was an excellently executed publicity stunt? Because now, the fact that the majority of Americans consider themselves pro-life won't matter. The fact that Obama voted three times as a state senator against legislation which would criminalize born-alive abortions will be forgotten or ignored because the MSM refuses to talk about it. The fact that Obama approved tax funding for international "family planning" centers, some of which engage in late-term abortions, will continue to be totally sugarcoated by the MSM. Oh yes, Barack Obama, the MSM and academia all got exactly what they wanted from this - a bunch of screen shots and video and audio clips of religious protesters who, in the brevity of their media exposure, were unable to articulate the source of their discontent. It all adds to the picture of Obama as the "change we need" and conservatism as "out of touch." It was very masterfully done and I give them credit for it. Never forget one of the primary rules of political propaganda is to define your opponent before he can define himself. This dog and pony show managed to paint Obama's opponents in an unfavorable light, further blinded the uninformed masses to his extreme pro-abortion stances, added credence to the belief that he's some how "reaching across the aisle" because he spoke at a supposedly "pro-life" venue but at the same time reinforced his image as a "smart guy" by having Notre Dame's president grandstand for him for about half an hour as if they were at a political rally. We've discussed this "extremist" issue at length already, but it never hurts to have a flashy video accompaniment. Props to Illuminati TV for the production of this film. Their YouTube feed is linked on the right side of this blog. stagflation: sluggish economic growth coupled with a high rate of inflation and unemployment. It took over 200 years for the United States' monetary base to reach $800 billion, but by late 2008 it doubled to well over $1.6 trillion - which was twice the amount of paper dollars that were in existence in the summer of 2007! We were told that all of this money was necessary as an injection into the banking system, so as to keep the banks open and loaning. 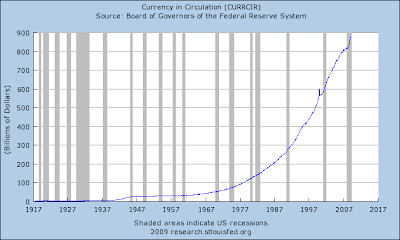 Yet, only a small amount of all that extra currency shown above has made its way to the banking system and into circulation. But when it does, inflation will inevitably follow (i.e. more dollars in a system means that each dollar is worth less). This is bad news for anyone holding dollars, but precious metals will likely maintain their value. As can be seen from the chart below, we are printing an unprecedented amount of money and injecting it into the system which - when paired with the mounting unemployment rate - will invariably lead to a "misery index" even Jimmy Carter couldn't ignore. 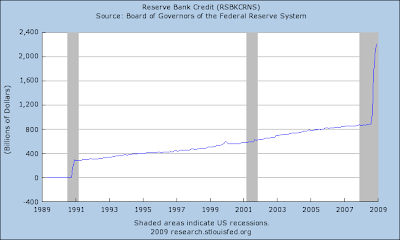 To put this in perspective, let's look at how many dollars the banks borrowed from the Federal Reserve through 2007. 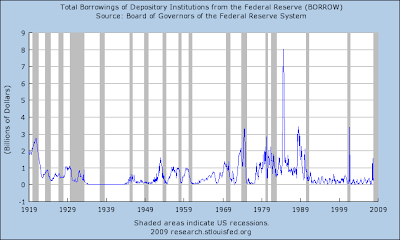 Note the tallest spike, which indicates the banks had to borrow $8 billion from the Federal Reserve during the Savings and Loan Crisis in the late 1980s. Now, here is the same chart, but through 2008. You can't even see the $8 billion Savings and Loan Crisis spike anymore! Currently, the banks are around $700 billion in borrowings. Ask yourself this: Are our economic troubles today 100 times worse than the Savings and Loan crisis? If not, then why do the banks need 100 times more borrowings? 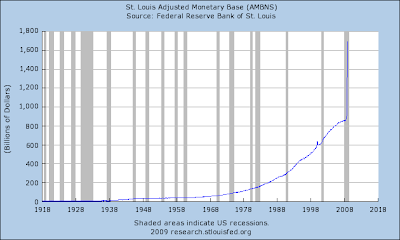 The following chart shows the total amount the Federal Reserve loaned out through 2008 - to include the 2008 bailouts. 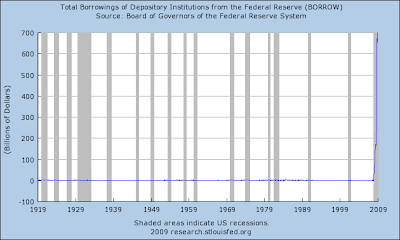 At the end of 2007, the Federal Reserve had loaned out roughly $800 billion. By the end of 2008, the Fed gave out $2.2 trillion. Then, add all of that to the current $11.2 trillion dollar national debt, and tell me... what do you think is going to happen to the dollar? Here's a hint: See what Germany was up to... oh around 1923... and then you might have some sense of what lies ahead for America if our government does not curtail it's printing and spending of American currency. -The Federal Reserve research was provided by the Federal Reserve Bank of St. Louis and brought to my attention by Sylvan Butler. On October 7, long after Lehman Brothers collapsed and the extent of our economic downturn was known, Teresa Finch of Nashville, Tennessee, asked both presidential candidates: “How can we trust either of you with our money when both parties got — got us into this global economic crisis?” Then-candidate Barack Obama replied: “What I’ve proposed, you’ll hear Sen. McCain say, well, he’s proposing a whole bunch of new spending, but actually I’m cutting more than I’m spending so that it will be a net spending cut.” A “net spending cut.” That is what the President of the United States promised the American people. And of all the promises that President Barack Obama has broken, his “net spending cut” broken promise is the most flagrant by far. 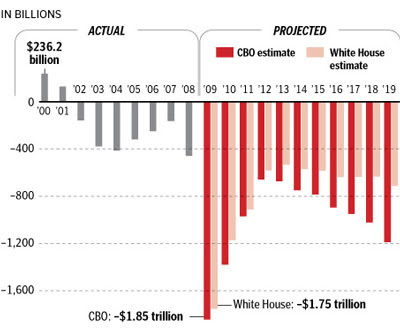 First, Obama’s proposed $17 billion cut is still less than half of 1% of his proposed $3.69 trillion FY2010 budget. Second, half of the cuts Obama wants to make are in defense spending and were already announced by Defense Secretary Roberts Gates. Third, the cuts are half as ambitious as the $34 billion in cuts former President George Bush proposed last year. Fourth, the cuts have little chance of actually happening. The Democrat controlled Congress approved less than $2 billion of President Bush’s spending cuts. Finally, and most importantly considering President Obama’s October 7 promise to the American people: The proposed cuts, if adopted by Congress, would not actually reduce government spending. Obama’s budget would increase overall spending; any savings from the program terminations and reductions would be shifted to the president’s priorities. Former Vice Presidential candidate, Jack Kemp passed away this past Monday at the age of 73. He was a great American, and his brand of leadership will be sorely missed. I find that picturing Obama as the glutenous rat from Charlotte's Web makes it easier to get through the day. If associating Clifton's smorgasbord of carnival snacks with Obama's wasteful binge spending doesn't cause you to at least crack a smile, check your freaking pulse.